The bikers who were fans of Sachin Tendulkar and asked him for a selfie on a road, Sachin Tendulkar, in turn, asked them to promise that they will wear a helmet from now on.Sachin is also seen lecturing the boys on how life is precious and why is it important to wear a helmet while riding on bikes and scooters. Sachin Tendulkar’s words seemed to work its magic as the two boys said that they promise to wear a helmet from next time. 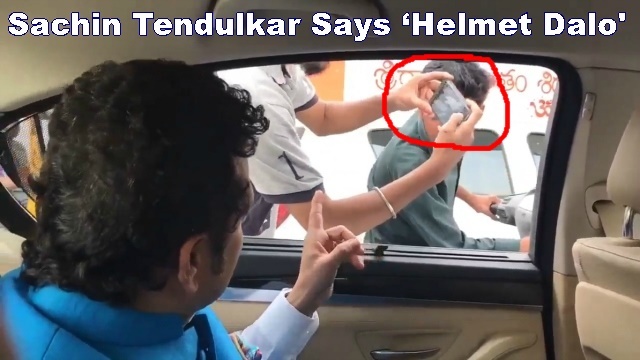 While the two boys managed to get a selfie for their deal to adhere the road safety rules, a couple who noticed Sachin Tendulkar and waved at him were also asked to wear a helmet as Sachin said, “Helmet Dalo Bhai!” making hand gestures to make his point clear. This new effort by the cricketer are extremely impressive, and we sure hope that people follow this basic road rules more! After spreading the message of the road safely offline, Sachin Tendulkar took to Twitter to spread the word online as well. “Helmet Dalo!! Road safety should be the highest priority for everyone. Please don’t ride without a helmet,” See Sachin Tendulkar Shared video on Twitter was captioned.